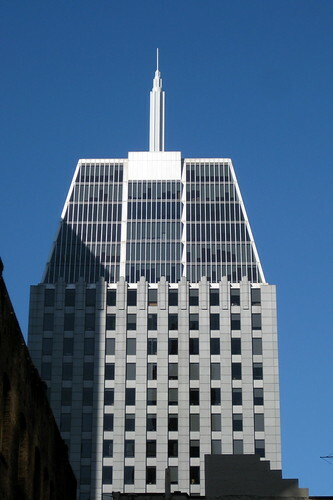 Ask the Appeal: Why Does 505 Montgomery Have a Mini Empire State Building on Top? If you are approaching SF from the Bay Bridge, or if you are up around Nob Hill/Russian Hill looking towards the Financial District, you will note that there is a replica of the Empire State building on top of the one of the FiDi high rises. A little Google search informs me that it’s on top of 505 Montgomery. But my question is – why? It’s so random… what’s the story there? “I hate to give you a disappointing answer, but it actually isn’t the Empire State Building,” said Martin Brown, president of the Empire Group, which built the building (the group’s name is etched onto a visible cornerstone). Um, COOL. Now all we get are Levi’s Workshops.